This is my own review of a Puget Sound (WA) area business. I was not paid or perked to write this review – I just want to help get the word out! Low Rate Hauling & Yard Clean Up is a Puget Sound area business specializing in – what else? – hauling away debris. I called them at 5:30 in the afternoon just hoping to get a quote, but they were able to come out immediately and the JOB WAS DONE three hours later. SHOCK AND AWE! Low Rate Hauling was fast, friendly, and took care of this nasty job so fast I had to look twice to reassure myself it actually happened. These two guys worked very hard and quick and left the job site pristine. A+! 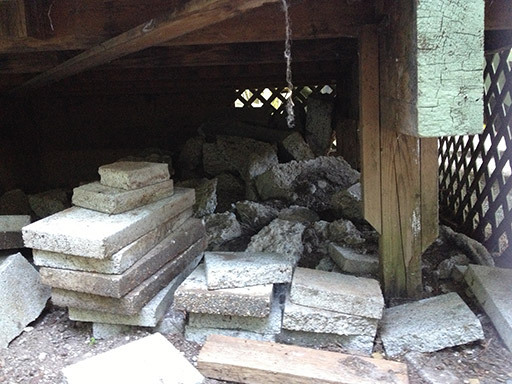 My home came with a giant mess of broken-up concrete underneath the deck. The pieces were so heavy and the deck so low to the ground, I had no idea how we would haul these blocks of concrete out. I also had no idea how we’d dispose of them. 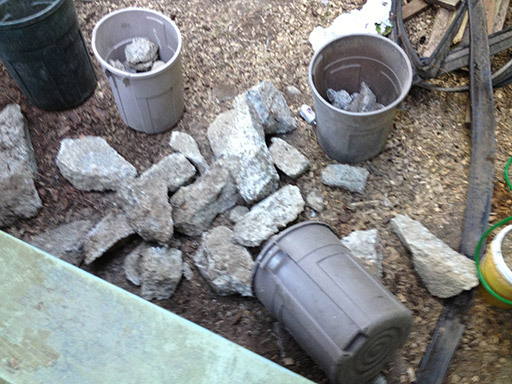 The debris removal process looked like this – Low Rate Hauling & Yard Clean Up just put the blocks into bins and hauled them to their truck. The price (a few hundred dollars) was beyond reasonable for how hard these guys had to work to remove the concrete, haul it up the hill, and get it out of my backyard. They were totally awesome, I would hire them again in a heartbeat for junk removal in the Puget Sound area. Give ’em a call at (206) 683-6412.